Modern architecture. Intuitive user experience. Fast performance. Intelligent data discovery. The next generation of data analytics is here. Visualizing and analyzing data doesn’t have to be challenging – in fact it can be easy and fun! Learn about just a few of Informer’s exciting features below, then contact us for a personalized demo to see the whole picture. all kinds of custom visuals showing what’s happening within your organization via plug-ins. You can easily filter to select the data you want, view side-by-side analysis in a Comparison Dashboard, and drill down into underlying data for a deeper understanding. For a personalized view of real-time information, simply add your visuals to an Informer Dashboard and customize the layout by dragging and dropping or pin favorites to your Informer home page. Informer elevates the roles of end users from data collectors into data analysts. How? Informer makes it easy to spot patterns, opportunities, and trends in real time, and provide valuable management reports on your business operation’s key performance and profitability metrics. Not sure which visuals are the best to use in a particular case? No worries. With Informer’s Discover feature, simply select the fields you want to see and Informer instantly fills your screen with a variety of relevant visuals. Have fun playing with Discover’s dynamic filters to interact with your visuals and drill down into more granular views. Regardless of your technical knowledge, you can quickly make informed, data-driven decisions with Informer. 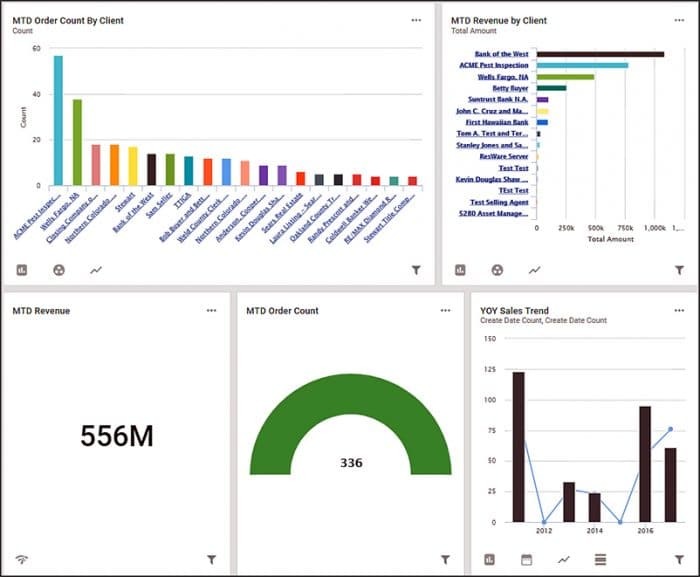 Users within your organization will find it enjoyable to explore and analyze data, and share their insights thanks to Informer’s easy to use screen layout which provides multiple views for accessing and interacting with data. Informer enables faster access to data while providing greater control by utilizing Informer Datasets — curated subsets of your data. Datasets can be refreshed immediately when you need real-time information, or on a schedule to reduce the number of hits to your production database. Administrative users can create and combine governed Datasets from any Datasource — separate sources, structures, or systems that include traditional database, MultiValue databases, spreadsheet, or your own Informer Workspace. By selecting various Data Filters, you can quickly narrow down different views of the data, and save your filters for later use. Then, simply drag-and-drop to sort columns, aggregate data into relevant groups, and create cross-tab view pivot tables for summarized views. You can even add your pivot table into a Dashboard where it’s dynamically updated. Learn more about Data Filters. Designed with the goal of organizational sharing, ownership, traceability and security, Informer Teams establishes a single source of truth for data within each of your departments, Finance, Human Resources, Development, Sales, etc. This data is governed, transparent, and traceable. Informer’s Team-based architecture ensures you can safely collaborate by sharing information within your department and organization to achieve fact-based planning and decision making. With Teams, each of your groups can store their data in their own Dataset. By setting granular-level access privileges to prevent other groups from changing their data, they ensure data governance and confidently share their Dataset with various groups within the organization. Now, the other groups also have confidence they’re working with a single version of the truth. Use shared Team Reports to swap comments, compare insights and move ownership of a Report to your team for review. You can securely share Team Reports outside of Informer, publish a Dashboard to the web, or invite others to view Dashboards with a simple hyperlink. With Informer Jobs you can define and execute workflows containing a set of tasks to be accomplished. Easily distribute data where and when it’s needed. Schedule a report refresh and run times manually, on a set schedule, or as an alert when specified conditions are met. Creating customized emails is a breeze with Informer’s HTML rich-text email editor. 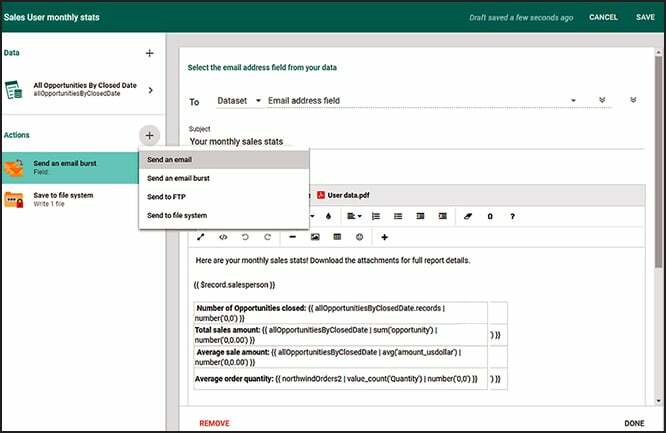 For example, personalize emails by adding Report content or data to query within the body of the email. Add field data from multiple Datasets, upload images, or even embed interactive visuals without having to include a whole Dataset. 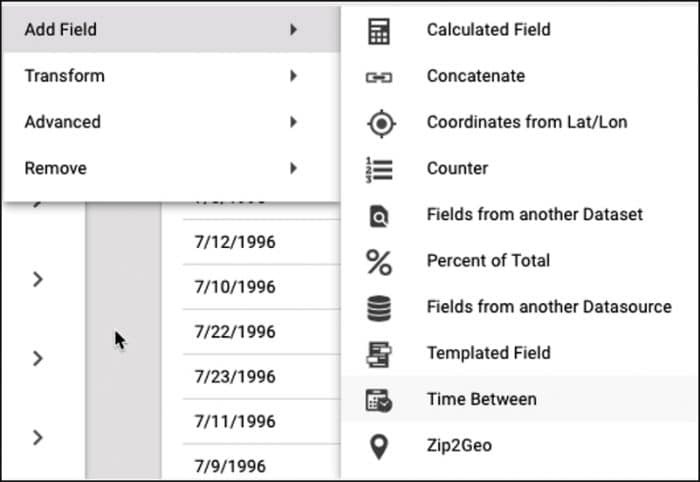 You can attach multiple Datasets as a CSV or spreadsheet, or add all attachments to a zip file. Send individual or burst emails, send to FTP/SSH or to your file system, or create your own custom automations. It’s all so easy! Data preparation is a critical step when aggregating information for reporting, analysis and collaboration. Informer’s unique Data Flows feature enables you to review, cleanse, and prepare your data as it comes into the system. You can lock down specific data views and secure sensitive fields, all without limiting end users’ access to the content they need. Write custom scripts to transform data into exactly how you want it to appear. Learn more about Data Flows. 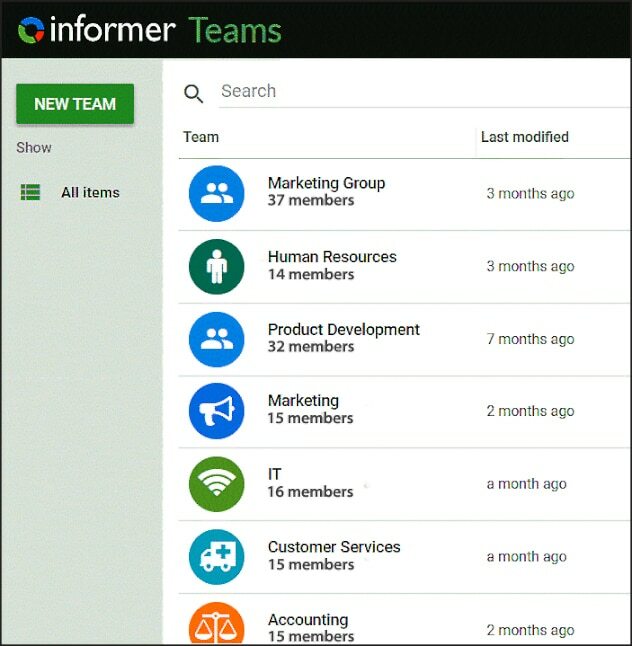 By using Teams, Informer administrators can strictly govern content to logical group members based on your organizational structure. Integrate with your LDAP/Active Directory or add members individually. 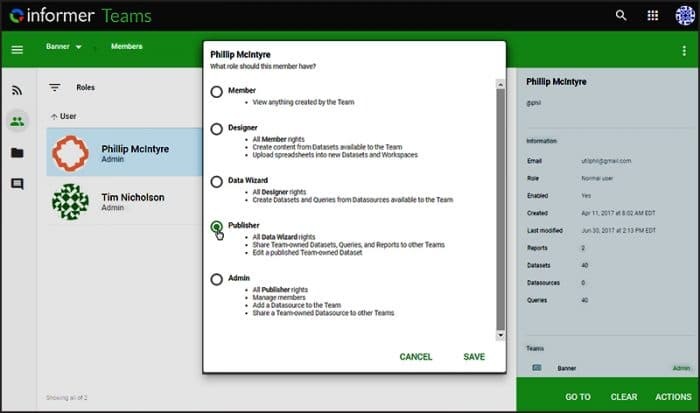 Assign roles to Team members based on security levels. 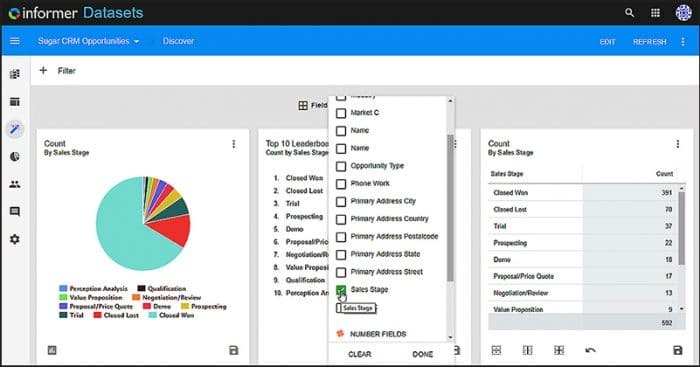 For example, you can allow consumer-type roles or creator-type roles to view and drill into data or access Datasources and create high level Reports. You can also integrate your organization’s login with a secure single sign-on. It’s also easy to audit system usage and manage Report ownership on one screen. Whether working with dozens or millions of rows, database administrators and business users will be pleased to not experience a slowdown when accessing large Datasources. Thanks to Informer’s powerful streaming and indexing functionality, you’ll see your data within a matter of seconds. Quickly connect to traditional databases, spreadsheets, or unstructured data streams, all without time-consuming warehousing. You can also easily blend data from different sources. Informer comes out of the box with a variety of common database connectors including MySQL®, Microsoft SQL Server®, Oracle®, and MultiValue databases including UniVerse®, and UniData®. 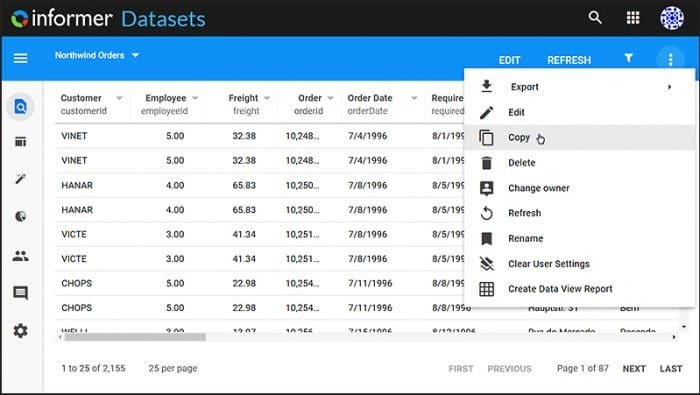 Import multiple spreadsheets to create your own Workspace – a totally custom Datasource. With one click, your mappings and links can be automatically imported with your database. Have a unique Datasource? Your integration possibilities are endless with Informer’s pluggable architecture. Custom drivers can easily be created or connected without complicated work-arounds. Informer also allows for Big Data integration including connection to Hadoop and Mongo DB. Informer’s out-of-the-box capabilities are only the beginning. With Informer’s flexible architecture, you can create and bring in resources that are specific to your industry, product, or service. Informer’s pluggable architecture makes it ideal to integrate other applications. Informer 5 offers a flexible, robust RESTful API Content Engine that enables IT administrators and developers to easily interact with external programs to tightly integrate Informer 5 with other applications. Want a complex authentication plug-in but don’t want to write it yourself? Our customer service staff is here to help. Entrinsik partners can also easily customize, brand, and embed Informer into existing software to create a cohesive analytics infrastructure. Modernize and extend your data discovery and analytics capabilities so you can make data-driven decisions faster than ever before. Informer makes it possible. 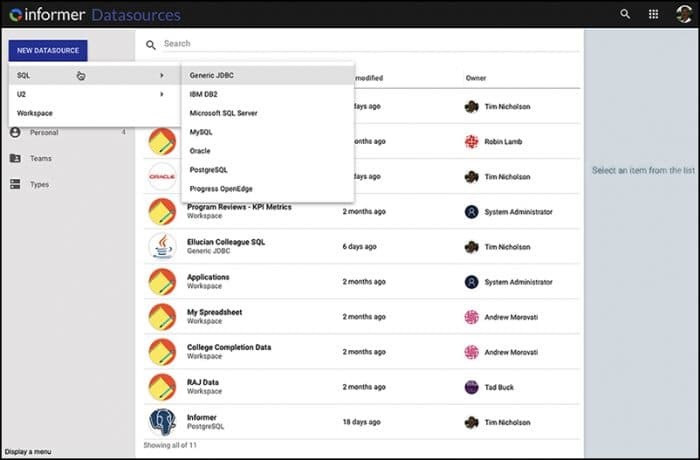 Watch a brief product tour; then contact us for a more personalized demonstration to see the full breadth of capabilities and discuss what Informer can do for your organization. For a free 30 day trial, call 888-703-0016 or reach out to us with questions at informersales@entrinsik.com. Ready to learn more about Informer?